Compliments are nice things to say to people, and by “people,” I am including your partner – especially if you want to keep relationship / marriage romance alive! Are you more likely to thank a waiter for bringing you a glass of water, or your partner? If your answer is, I am more likely to thank them both, and I do so regularly, then you might already be off to a good start with strategy # 25. When you have nice things to say to people, otherwise known as compliments, you are developing a habit that will pay off in your marriage romance department (or pre-marriage for that matter). Just be sure you have nice things to say to your partner, too! Do you ever tire of hearing, “You look great, baby,” or, “Good job, I’m so proud of you!” and, “What a great dinner – thanks for cooking,” and, “I couldn’t have picked a better partner in the entire world.” I know I don’t about you, but I don’t tire of hearing these sorts of things. Ironically, the more we say nice things to people, the more nice things we hear. Guess it’s true, what goes around, comes around. Do you know the two most important ingredients to sustaining a long-lasting romance, according to researcher John Gottman? When you say nice things to your partner, you are making one of the most powerful feel-good contributions you can make to your relationship on an every-day basis to create a strong foundation of fondness and admiration. When you find multiple ways to express your fondness for your partner, and you are able to communicate your admiration, you will benefit from her feeling desired. To keep the home fires burning, both partners need to continue feeling good about themselves. Random, authentic, compliments to one another is a great way to fan the flames of marriage romance. You are likely already thinking many things, the key is to start saying them OUT LOUD. What are other nice things to say to your partner to improve your marriage romance? Time with you is my favorite. There is no one I would rather spend time with than you. I have so much fun with you. There’s no one I’d rather wake up to every morning than you. I can’t help but smile when I see you. I am so proud to be your girl. You can say nice things to people about their appearance, abilities, personality, behaviors, style, humor, values, what they do, how they move in the world, ways they make you feel, etc. The list of compliments is really endless. What nice things to say to people are you comfortable with? (Share in comments section if you want). Also, when you make it a habit to have nice things to say to people, it becomes second nature. Clearly, you will not say to your friends, family and coworkers the same romantic sentiments you share with your partner, but the more you practice giving compliments to people, the easier it is to do with everyone. 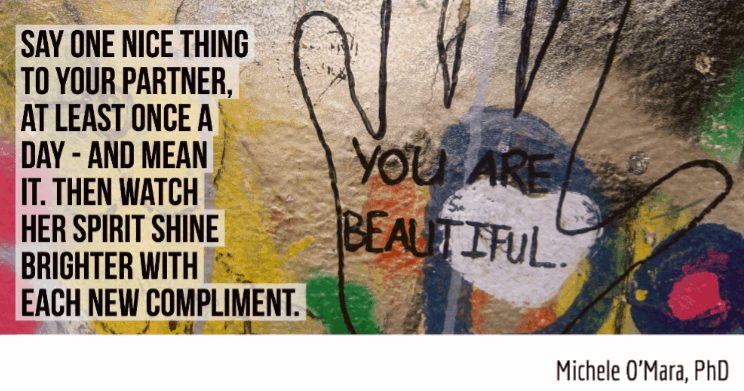 Share at least one compliment a day with your partner. A compliment a day keeps the therapist away.